To railroaders, the Midwest means nonstop action with plenty of variety. Pentrex takes you to Missouri, Nebraska, Iowa, South Dakota, and Minnesota to sample the finest in Midwestern railroading. The Class 1 railroads provide heavy traffic and high-speed excitement. Among these are Kansas City Southern, Union Pacific, Illinois Central, and Burlington Northern Santa Fe. Motive power ranges from Illinois Central GP10s to the latest EMD and General Electric AC locomotives on Union Pacific. There's even a rare EMD BL20-2. Regional railroads are becoming increasingly important in the Midwest. You'll see the Dakota, Minnesota & Eastern with its intriguing mix of power and will catch one of its passenger specials. Shortlines provide a vital link between shippers and trunk lines. We visit the Nebraska Northeastern, Sisseton Milbank, Dakota & Iowa, Nobles Rock, and the Ellis & Eastern. Each has its own personality and interesting locomotive roster. 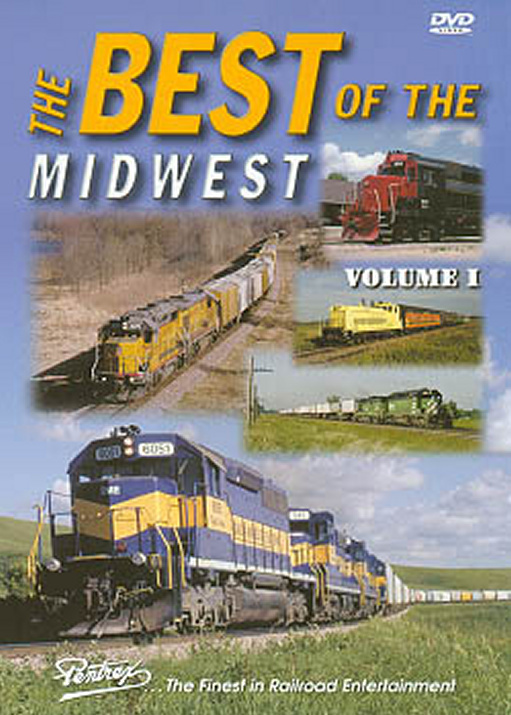 From shortlines to the high iron, a rich and colorful mosaic of railroading is yours to enjoy in The Best of the Midwest Volume One! Counting my childhood, nearly 40 years were spent on the farm, or in a related agricultural based industry. We knew the importance of the railroad for the transportation of products in and out of the region. Watching this video brought back so many great memories of days gone by. Best of the Midwest, Vol. # 1 is based in the region that is so dependant on agriculture. And agriculture is dependant on the railroad. Mainline, Class 1 railroad action, add in regionals and shortlines, serving low populated regions is exactly what this video is all about. It gives a real day to day experience of the needs of rural America and how railroads and agriculture are tied into together. We also witness the movement of products that many people may not even consider, like a shortline railroad hauling sand, for only one example. This video is filled with variety. Different companies, power consists, make-up of the loads and cargo, name it and you will likely find something associated with life out side the urban regions of the United States and Canada. As a model railroader, I saw so much that impressed me. I'm viewing this video serveral times in short order to study and take notes of things like the building structures, the landscape, and actions of the railroad. It is amaizing how much imformation is in this video that can be added to the layout for a more realistic. I guarantee that purchasing this video will not be a disappointment. Highly recommended for all railroad fans. Enjoy, I know you will.